So a few days before Christmas I decided to go with my baking frenzy. 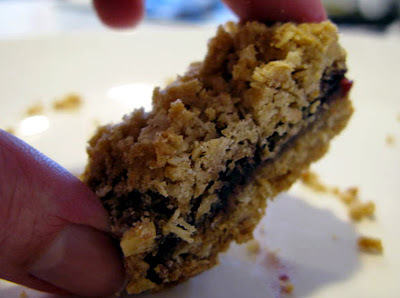 I've already posted about the oatmeal-pecan shortbread and the oatmeal fruit bars. I also made another version of these super chocolatey cookies, but instead of chocolate chips in the chocolate cookies, I used peanut butter chips in the chocolate cookies. Just a straight substitution. I opted for the small cookies. Sift first 3 ingredients in medium bowl. Use electric mixer to beat butter in large bowl until fluffy. Add brown and white sugars; beat until blended. Beat in eggs, 1 at a time. Then beat in vanilla. Add dry ingredients, beating until just blended. 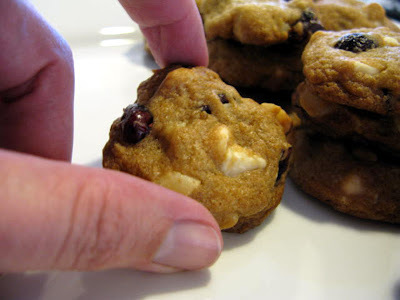 Gently stir in cranberries, white chocolate chips and nuts. 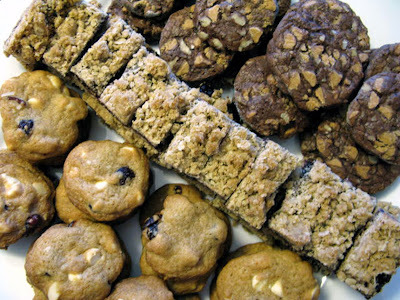 For larger cookies, drop dough by heaping tablespoonfuls onto baking sheets lined with parchment paper, 2 1/2 inches apart. For smaller cookies, drop dough by level tablespoonfuls onto sheets, 1 1/2 inches apart. Bake until just golden, about 18 minutes for large cookies and about 15 minutes for small cookies. Cool. After a full day of cleaning and baking, I was able to get the dough for these made that night, but I did not bake them until the next morning. The dough had hardened up a lot in the fridge, so I let it sit out of the fridge for about 30 minutes then baked them. The dough can be made and stored in the fridge in an airtight container for two days or in the freezer for up to two weeks. And that was the last of the cookies. Though I did also make a chocolate-rum cake on the 25th for Christmas dinner's dessert. It may be a while before I bake again! For years on Christmas Eve, if I didn't have to work, I have cooked some sort of fish dish. I am not sure why that is. It is just something I have done. Maybe because I know on Christmas Day I will get meat, meat and more meat. But this year I was craving chile of some sort. Instead of my usual tomato-based bean chile with ground beef, I decided on a chile verde: pork cooked in a green sauce of roasted tomatillos and peppers. I added the potatoes to bulk it up and because that is how my dad liked to make it. It was an excellent choice and was even better as leftovers once the flavors had time to really meld. It also freezes well. I did several single serving portions in zipper bags that I can pull out of the freezer as needed. Pork shoulder works well in this. I could not find that this time, so I used a boneless pork roast and cut it into cubes. Remove outer husks from tomatillos. Wash and dry tomatillos and peppers. Place tomatillos and peppers on a baking sheet and broil, turning every few minutes, until they are roasted on all sides and skin starts to bubble and split. Let cool and set aside. Season pork cubes with salt and pepper then dredge with flour. Heat oil in a large, heavy skillet over medium high heat. Brown pork in small batches, on all sides. As batches of pork are done, transfer from skillet with slotted spoon into a large stock pot. Continue until all the pork is cooked and in the stock pot. You may need to add a little oil to the skillet depending on how many batches you have to cook. 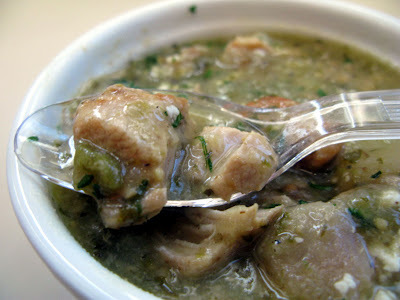 While the pork is cooking, dice the tomatillos and set aside in a bowl with the juices. Dice Anaheim/Poblano peppers and set aside. Once the pork is all cooked and in stock pot, add onions to the skillet and cook over medium low heat, stirring occasionally, about 5 minutes. Add peppers and cook 3-4 minutes, then add garlic and cook 1-2 minutes. Transfer the onions and peppers to the stock pot with the meat. 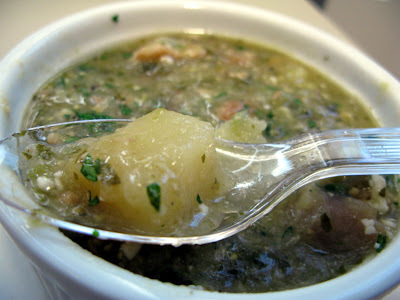 Add chopped tomatillos, dried herbs and cilantro to the meat. Pour in chicken stock just to cover the meat. Bring to a boil over medium high heat then reduce to a simmer. Cook for about 2 hours uncovered or until the pork is fork tender. 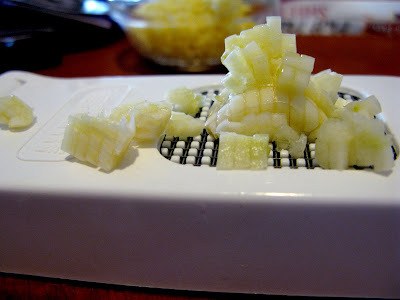 When pork has been cooking for about 2 hours, peel potatoes and cut into 1-inch cubes. 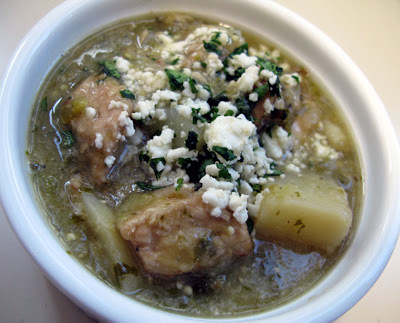 Add potatoes to the pork and cook another 30-45 minutes or until potato pieces are tender. Garnish with cilantro, cheese, etc. Enjoy. These are a favorite treat all year long. This was the first time I made them as a Christmas cookie, and they were a big hit at work. Lucky for me I did not take the whole pan to the office yesterday. I will be bringing some of these to my aunt's tomorrow for Christmas dinner. In a large bowl combine flour, oatmeal, brown sugar, baking soda. 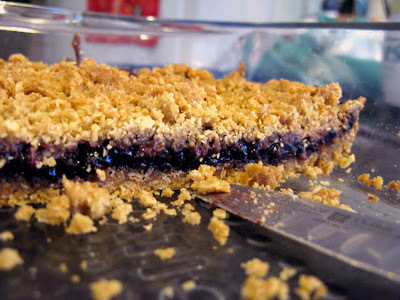 Cut in butter and mix until it forms coarse crumbs. For me, the best way to do this is to use my hands. Firmly press about half, maybe slightly more, of the flour-sugar-oat mixture into the bottom of an ungreased 9x13 pan. Heat fruit preserve in microwave for about a minute or until softened but not hot so that it is easily spreadable. Spread softened fruit preserves over first flour-sugar-oat layer, but not quite all the way to the edges. Leave about 1/8 inch at the edge. This will help keep the fruit from seeping to the edge and sticking to the pan during baking. Sprinkle remaining flour-sugar-oat mix over top of preserves and gently press it down. Bake for 30-35 minutes until the top gets golden brown and crispy. Cool in pan then cut into squares to serve. If they stick a little, just run a butter knife around the edges. They usually come up OK with minimal sticking. For cookie bars, this is best to cool completely before cutting. It needs a little time to set up. But I have served it warm with vanilla ice cream, kind of like a fruit crumble or crisp. For the cookie plate that I took to work, I cut these fairly small. Just about two little bites. This time I used blackberry preserves. I have also made them with marionberry and peach. And I wonder how they would be with marmalade. I may have to try that next time. My Sunday, which is most people's Monday was busy with cleaning and cooking and baking. 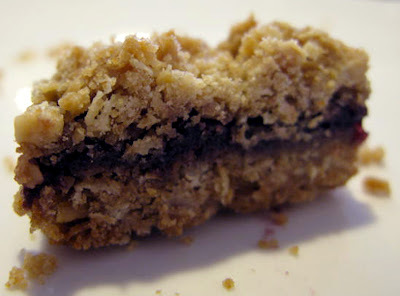 One of the things I baked was this oatmeal-pecan shortbread that I have posted here previously. To dress them up for the holidays, I melted down some chocolate chips and drizzled it over the top of the cookies. I like Guittard brand. It is tasty and it melts nicely and sets up quick. 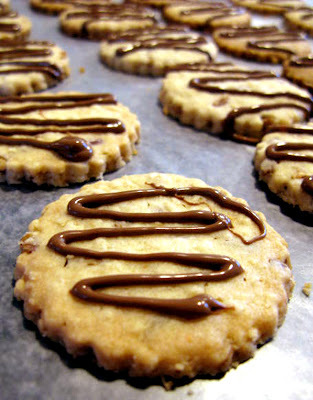 I made the cookies Monday night, melted and drizzled the chocolate Tuesday morning. I melted the chocolate in a glass bowl according to package directions then used one of those mustard/ketchup/condiment bottles to drizzle it on the cookies. After about 30 minutes of fridge time on baking sheets to set up the chocolate, I packed them in layers separated by wax paper so they would not stick together. These were a big hit the first time I made them with no chocolate. I think they were more popular this time with the chocolate drizzle. So the pictures of this did not come out great. For some reason I have trouble photographing pasta. But the dish was so tasty I had to post it anyway. I mean really, really tasty. I only started making this recently. I looked at several recipes and took the parts of each that sounded best to me, cobbling together this version. On a whim, I added some sauteed shrimp on top. But it is still good without the shrimp. It's also good with some sauteed asparagus or peas or zucchini tossed in with the pasta. Cut bacon or pancetta into a small dice and cook until crispy. Drain on paper towel and set aside. Discard all bout about 1-2 tbsp of the bacon fat in the pan. Cook pasta according to package directions. If the pasta is done before the sauce, drain it and set it aside. In the same pan that the bacon cooked in, sautee the onions, garlic and dried oregano for about 5 minutes or until tender and just starting to brown. Add wine and boil until reduced by half, 1 to 2 minutes. In a separate bowl, whisk together eggs and cream. Add in a dash of salt and pepper, nutmeg and grated cheese. Toss gently over medium heat to combine. Remove pasta/onion mixture from heat and add eggs/cream mixture and parsley, gently tossing to combine. I have always liked cauliflower, but just steaming it gets old. Another option is to roast it. It gives it a nice, nutty flavor. Add a little curry and lemon juice, and you get a lightly spiced version. Whisk oil, lemon juice, curry, salt and cayenne in a large bowl. Toss cauliflower in the oil mixture to coat. 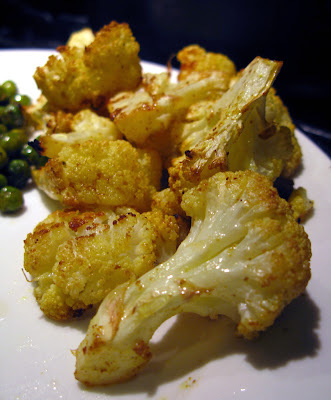 Spread cauliflower on a baking sheet in a single layer and roast 25-30 minutes, or until golden brown and chewy, turning about halfway through the cooking time. I use a lot of garlic. Which means I chop a lot of garlic. Normally I am not that into kitchen gadgets. I like to chop and dice and julienne. 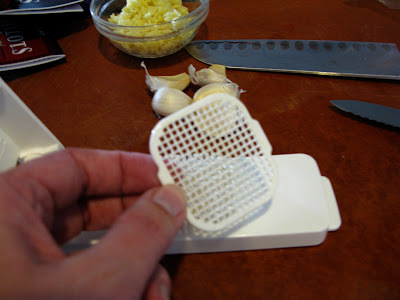 But on those days when I need a lot of garlic chopped, I like the Alligator garlic chopper. 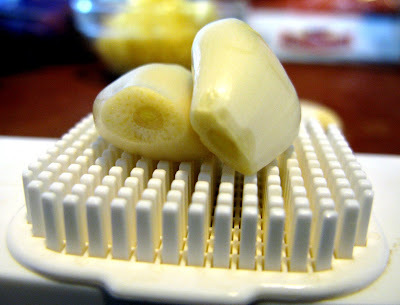 It is made up of three pieces: the bottom piece with the teeth, the top part with the grid cutting blade and the little piece that keeps garlic from sticking in the teeth. This little piece goes down in the teeth. It makes cleaning the thing easier. Just pull the little grid out and any little remnants come out of the teeth. 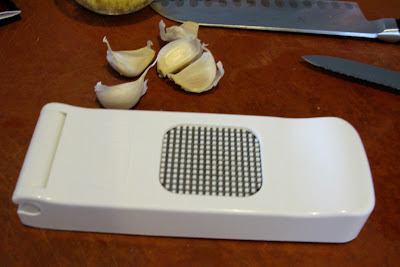 And you get neatly sliced bits of garlic. A lot of times I use the garlic at this size. 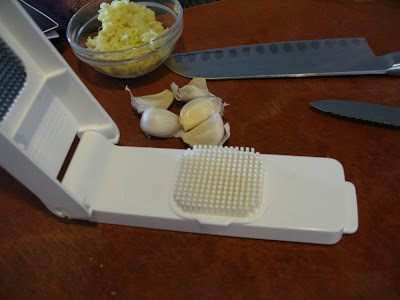 But sometimes I want it minced more finely, so I will run a knife through it a couple times. Yes, I have been cooking the past couple weeks. And now I have a few things stored up in my brain to blog about here. This was a great side dish to have with a simple grilled flank steak. 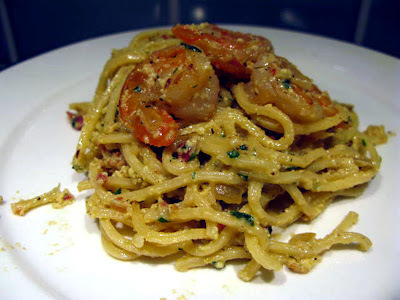 It was very rich and creamy and flavorful, but still light with the ricotta. And the next day I cut one of the stuffed zucchini pieces into slices and scrambled it with an egg and a little bit of chopped up, leftover steak. It was delicious! 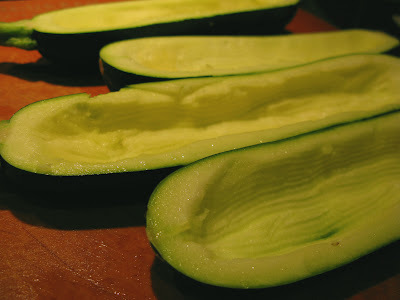 Using a small spoon (I like to use a grapefruit spoon), scoop out the pulp from the zucchini halves and discard. You want to scoop it out to leave a rim about 1/4 inch around the edges. Heat 3 tablespoons of the olive oil in a sautee pan or skillet over medium heat. 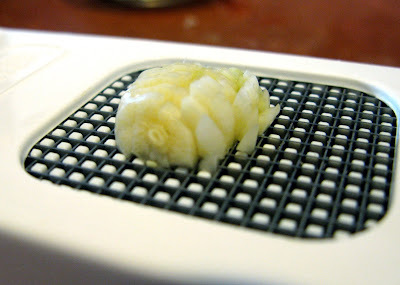 Cook garlic and onions until translucent, about 5 minutes. Add tomatoes and cook, stirring occasionally, about 4 minutes, or until soft. Remove from heat and set aside to cool a bit. 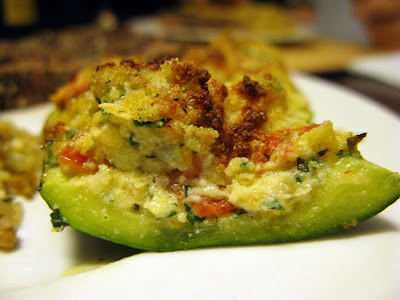 In a medium bowl combine ricotta, 1/2 cup of the manchego, 1/2 cup bread crumbs, parsley, mint, oregano and egg yolks. Gently stir in the tomato-onion mixture and season with salt and pepper. Set aside. 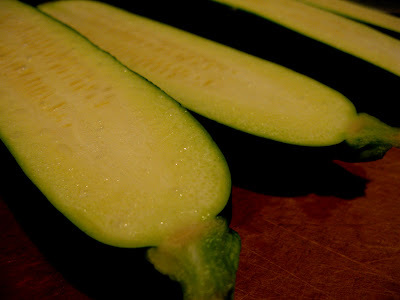 Rub inside of zucchini with remaining olive oil to coat lightly and season with salt. 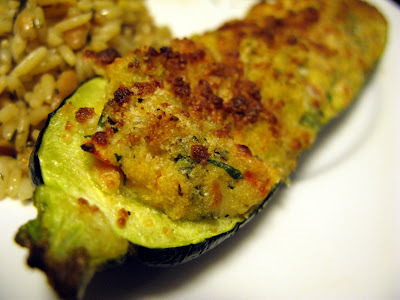 Place zucchini cut side up in a shallow baking dish or on a baking sheet. Broil on high for about 5 minutes. Remove baking sheet from oven and fill each zucchini half so that filling mounds a bit, but does not spill over the sides. Mix together remaining bread crumbs and cheese. Sprinkle over the top of the filled zucchini pieces. Cook at 400 degrees about 10-15 minutes until hot, then zap under the broiler to get the tops golden brown and crispy. I like this picture. The cross-section shows how really yummy that filling is. The ricotta is creamy, but fluffy; the manchego has a lovely, nutty flavors; and the herbs and tomatoes give it a nice, fresh flavor. The eggs and bread crumbs hold it all together. I served these hot, but they can also be served at room temperature.